But, before you sign your life away with the Black Quill (okay, the Harry Potter references stop now, we promise), give our Mozo Student Credit Card Guide a read. While there are plenty of perks associated with getting a credit card while studying, there are also some potential traps you should avoid at all costs. Before we start, it’s important to remember that credit cards are not for everyone. Answer this: Do you have a regular income? No? You should probably stay away from credit cards from now (a nice, friendly, PG-rated debit card might be a better option). There are a few different types of credit cards. Like any relationship, introductions can be tricky, but it’s always easier when there’s a middle man. Let Mozo be your cupid, as we match you with the type of credit card that will suit you. A bit disorganised? Various card providers offer low-rate credit cards (often 10% less than standard interest rates). If you will occasionally find yourself paying interest on purchases, a low-rate student credit card with a nice long interest-free period is your ideal match. Pursuing this financial relationship because your mum thought it would be a good idea? Plan on just spending a tiny amount each month so you can avoid any chance of debt and walk out on your new partner in a few years with no baggage and a clean credit history? Go for a student credit card without an annual fee. You won’t earn the rewards that come with premium credit cards, and you probably don’t need the low interest of a low-rate credit card because you’ll pay off your balance in full each month. You pay for the privilege, with a relatively high annual fee (normally around $70 for an entry-level card). And, rewards cards tend to choose their friends carefully; many will only let you pair up if you’re earning a certain amount each year ($35,000 is standard). So, alas, this relationship might need to wait until after graduation. Like your personal finance products mysterious? Good, we’ll keep you hanging on the balance transfer card until later on in this guide. Click here if you’re impatient. Now that you’ve met your potential suitors, it’s time for some Agony Aunt real talk. When a provider says a student credit card is “no fee”, what they mean is that there is no annual fee. There are actually lots of fees, and most of them have to do with your ability to read a calendar. Late payment fees range between $5 and $20 at the major banks. To use the Year 5 public speaking technique of measuring monetary amounts in things that are relevant to your audience: that’s nearly three $7 Thai takeaways! If you’re strapped for cash and don’t think you can make a full repayment, make sure you always pay the minimum amount on time. By failing to make this deadline, you’ll incur a fee (normally around $15) in addition to the extra interest you will have to pay off by failing to repay your balance. It can also cause you to lose your interest-free period on future repayments, and mess up your credit rating. Mozo’s Top Tip: Set up a direct debit from your bank account to make sure the minimum repayment is paid each month. Rewards credit cards seem like a lot of fun, but, on a student’s budget, their attached annual fee can end up costing more than the ‘rewards’ they provide. Mozo’s Top Tip: Convert your expected expenditure on the card into the reward points the credit card would give you, and see what you could buy for those points. If your $79-a-year card will only earn you a $45 kettle, opt for a student credit card with no annual fee, and buy the kettle yourself with the money you’ll save. Did you hear us? At. All. Costs. Because if there’s any feature of your credit card that’s going to cost you a lot, it’s this one. While providers will let you use your credit card to get cash out at a branch or ATM, they will charge you for it. And it gets worse: those reassuring 55 interest-free days your credit card came with does not apply to cash advance payments; you will start paying interest immediately. Mozo’s Top Tip: Keep a debit card in your wallet next to your credit card, so you can get cash out whenever you need. It used to be very easy to scare people into never exceeding their credit limit: the banks just imposed a very high fee (usually $35), et voila! The people were definitely scared. But after a couple of class action lawsuits disputing the fairness of these fees, the penalties facing those who dare to go over their limit aren’t so black and white. As a general rule, if you applied for your credit card after June 2012, you won’t have overlimit fees, although it’s always a good idea to check with your provider. Mozo’s Top Tip: Who cares if you won’t get a fee? Think of your credit history and don’t go over the limit. On paper, balance transfer credit cards seem like the Robin Hood of personal finance products. They selflessly hold the debt from your old credit card so that it doesn’t accrue any more interest, and let you pay it off with a low interest rate or no interest rate at all. What great blokes. These cards offer a very attractive low interest for a certain period (normally six months). But, if you don’t pay off your debt within that period: BAM! You’re hit with a high purchase rate of around 20%, which is more than your student credit card would have charged in the first place. This section could really just be one word long: “DON’T.” But that seems lazy, so we’ll extrapolate. Any new purchases on the balance transfer card will attract the high purchase interest rate, which you were trying to escape from by transferring your balance in the first place. You then have to pay off these new purchases (and their high interest rate) before you can make a dent in your balance. Okay, now that you have all of the credit card information you can make a fully-informed choice about whether you want to take the leap and get a student credit card. But how exactly do you, um, do that? In all seriousness, if you’re the sort of person who feels more comfortable signing their life away to another human being than a phone line or an internet connection, you can apply for a credit card by wandering into your local bank branch. If you like to be able to ask a human being questions, but don’t really want to get out of your pyjamas, applying over the phone sounds like your kind of deal. Just make sure you have all of the documents listed above before you dial and remember that you can generally only call during bank hours. Hate people? Only have time to complete personal admin between 3am and sunrise? Online application is for you. Applying for a credit card online typically takes less than 15 minutes. You’ll still need your docs, but you’re free to spend a few minutes trawling through your filing cabinet (or shoebox under the bed - no judgement) if you forgot something. And, best of all, you can apply any time of the day or night. So, you’ve now chosen your new plastic match, know all about how to manage it, and have possibly even ordered it. But, we still have two final nuggets of wisdom before we’re going to let you take that new puppy home. The easiest way to find yourself in hot water when using a credit card is by failing to stick to a budget. If you’re the sort of adult who can have a credit card, you’re the sort of adult who can spend a few minutes each month writing out a budget. Arguably a sub-point of the previous point, but a point so important we decided to give it its own number. It can be tempting to believe your magic money is actually magic. But - sorry to all of the fairies about to lose their wings - magic isn’t real. 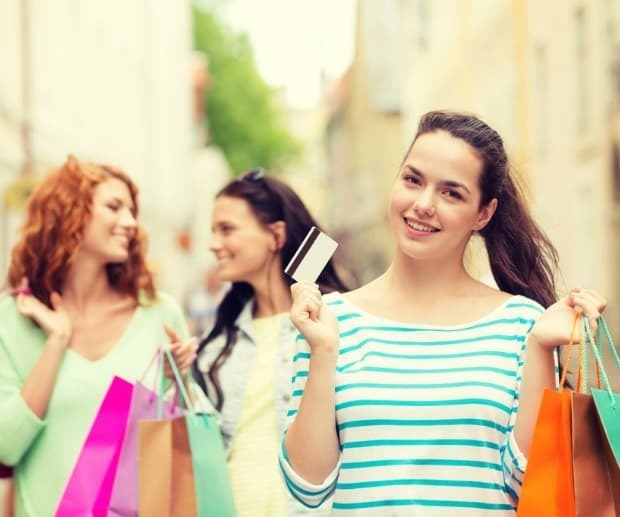 The credit card debt you will incur by going crazy at the sales, however, definitely is.